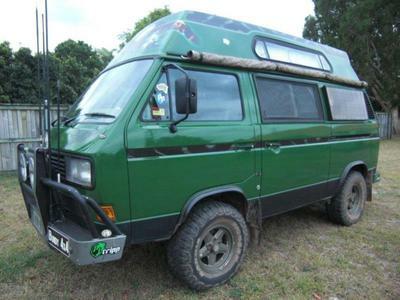 This is my 1990 VW Syncro camper van that I bought here in Australia. Over the years it has been used for different purposes. It started of to be a family mover with 5 recaro seats and a seat-bench to be converted into a bed when needed. Then the kids grew up and the seats where replaced with a fridge and other camping gear. And I also finally found the time for a major overhaul on it. All new breaks, aftermarket springs and shockies to fit 31 tyres. The diff was replaced with lower ratio to suit the bigger tyres. A donor van gave me the high insulated fix fiberglass roof and new furniture with a large Stereo TV was put inside, outside shower with hot water and other extras were fixed on the van as well. And after owning this great vehicle for 13 years, I was regretful about selling it, mainly for some more comfort in a larger camper van and a younger age.